Though taro has been cultivated since the ancient time throughout the subtropical and tropical latitudinal band around the earth, nowhere else has it been as cherished and honored as in the Hawaiian Islands. Kalo, as it is known here, is sacred. The creation chant, Kumulipo, states that when the body of Haloanaka, the first-born son of Wakea the sky father and Papa Earth mother, was buried, grew the kalo plant, also called Haloa which means everlasting breath. This respect for kalo also reveals its importance as the primary food source for the island nation. Depending on the variety, all parts of the kalo plant can be eaten, has medicinal qualities, and can be eternally planted as when it is harvested, the top two inch stem is cut and saved for replanting. Talk about sustainable. In the early days when cultivation was high, more than 300 varieties of kalo were being carefully propagated by planters. Varieties were cultivated according to microclimate, region, growing condition, seasonal variation, as well as use, size and taste preferences. About 87 if these varieties are still recognized today, such is Mo’i, Lehua, Ha’akea and Chinese. Kupunakalo is a good resource for those who are interested in varieties. The plant itself is tuber that grows a huge stem, sometimes up to five feet tall, with broad bright green heart shaped leaves. It grows mainly in carefully tended lo’i, natural or irrigated wetland (the original aquaculture design). There are varieties that can grow in rainforest climate as well. Kalo was often fed to babies as first whole foods and for elderly it is easy on digestion as well are fortifying. It is known as a good body pH balancer, an alkalizing foo. It has also been referred to as a key food recommended by holistic practitioners to absorb and carry away radiation in the body. – Before any part of the plant is eaten, it must be thoroughly cooked in order to breakdown the calcium oxalate crystals present in the leaves, stem and corm. If not cooked, it can irritate the throat. Also, it possible, cook the corms skin on to avoid contact with the crystals. If you have to peel before cooking, you might want to wear gloves. – The corm or tuber is steamed, baked or boiled. 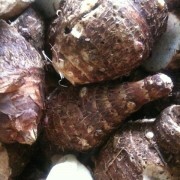 It is what is cooked to be used to make pa’i’ai and poi. Pa’i’ai is the mashed cooked kalo at pre-poi stage, when it achieves a stiff doughy consistency, it was often a stage in which transportation and distribution happened. To pa’i’ai water is blended to make poi. Poi can be eaten freshly made, or slightly fermented. Poi left out for several days acquires a sour taste and many love (especially those who are into the health benefits of fermented probiotic foods). Also, kalo is thought by many to be hypo-allergenic, a point of interest to those with gluten sensitivities. – Kalo leaves, or lu’au leaves are cooked stewed like collards. They are high in vitamins A, B’s and C; as well as minerals such as calcium, iron, and potassium. Stems are used in stews and soups. Look for corms without soft spots or cracks. Never store corms in refrigerator, better in cool dark area like other tubers. Leaves can be stored in refrigerator.